The source: Adolf Hitler. Bilder aus dem Leben des Führers (Hamburg; Cigaretten Bilderdienst, 1936). Fellow citizens! 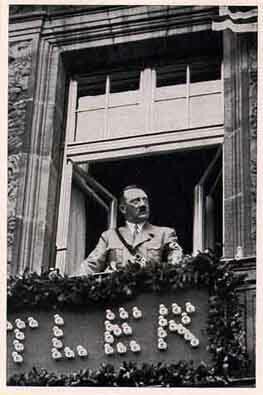 Two years ago on 20 April 1933, only three months after Adolf Hitler came to power, I spoke to the German people on the occasion of the Führerâ€™s birthday. It was not my goal then, nor is it now, to read out loud a passionate newspaper article. That I shall leave to better stylists. Nor will I praise Adolf Hitlerâ€™s historic work. I intend today, on the Führerâ€™s birthday, the very opposite. I believe it is time to portray to the entire nation the man Hitler, with all the magic of his personality, all the mysterious genius and irresistible power of his personality. There is probably no one left on the planet who does not know him as a statesman and as a remarkable popular leader. Only a few, however, have the pleasure of seeing him as a man each day from close up, to experience him, and as I might add, to come as a result to a deeper understanding and love for him. These few wonder how it is possible that a man who only three years ago was opposed by half of the nation stands today above any doubt and every criticism. Germany has found a unity which will never be shaken. Adolf Hitler is the man of fate, who has the calling to save the nation from terrible internal conflict and shameful foreign disgrace, to lead it to longed-for freedom. It is of this humanity, which those who are nearest to him see most clearly, of which I speak today. Adolf Hitler is one of the few state leaders who avoids medals and decorations. He wears only a single high medal that he earned as a simple personal solider displaying the greatest personal bravery. That is proof of modesty, but also of pride. There is no one worthy to decorate him, other then he himself. Any form of ostentation is foreign to him, but when he represents the state and his people, he does so with impressive and appropriate grace. Behind all that he is and does are the words of the great soldier Schlieffen, who wrote: “Be more than you seem!” His industry and determination in reaching his goal far exceed normal human strength. Several days ago I returned to Berlin at 1 a.m. after several hard days and was ready for sleep, but he wanted a report from me. At 2 a.m. he was still alert, still at work all alone in his home. For two hours he listened to a report on the construction of the national highways, a theme that would seem distant from the great international problems with which he had been occupied the entire day from early in the morning to late at night. 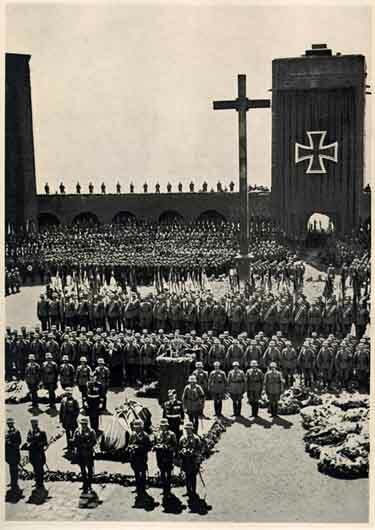 Before the last Nuremberg rally, I was his guest for a week in Obersalzburg. The light shone from his window each night until 6 or 7 a.m. He was dictating the great speeches he would give a few days later at the rally. His cabinet approves no law that he has not studied to the smallest detail. His military knowledge is comprehensive; he knows the details of each weapon, each machine gun as well as any specialist. When he gives a speech he knows each detail. His working method is entirely clear. Nothing is further from him than nervousness or hysterical tension. He knows better than anyone else that there are a hundred problems to be solved. He chooses the two or three he finds most central and works on them, undistracted by the remaining ones, for he know that if he solves the great problems, the problems of second or third magnitude will solve themselves. His approach to problems shows both the determination necessary to deal with essentials and the flexibility essential in the choice of methods. He has principles and beliefs, but he knows how to reach them by careful selection of methods and approaches. He has never changed his basic goals. He does today what he determined to do in 1919. But he has always been flexible in the methods he used to realize his goals. When he was offered the vice chancellorship in August 1932, he rejected the offer. He had the feeling that the time was not yet ripe and that the ground offered to him was too small to stand on. But when he was offered a wider door to power on 30 January 1933, he walked courageously through it. It was not the full responsibility he wanted, but he knew that the ground he know stood upon was sufficient to begin the fight for full power. The know-it-alls understood neither decision. Today they must reluctantly grant that he was superior not only in his tactics, but also in the strategic use of the principles in ways they short-sightedly failed to see. Two pictures last summer vividly showed the Führer in all his aloneness. The first showed him greeting the Wehrmacht just after he was forced to bloodily put down the treason and mutiny of 30 June. His face showed the bitterness of the difficult hours he had experienced. 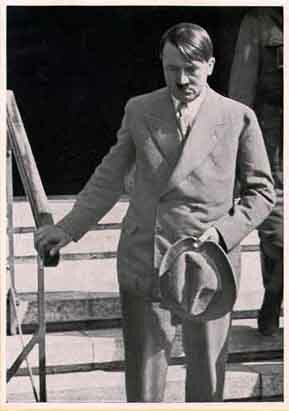 The second photograph was of him leaving the house of the dying marshall and Reich president in Neudeck. His expression shows the shadow of pain and sorrow in the face of pitiless death that in a few hours would tear from him his fatherly friend. With almost prophetic foresight to told us in his innermost circle on New Yearâ€™s Eve that 1934 would be a dangerous year, one which would likely see the death of Hindenburg. Now the inevitable had happened. One thing was plain in his granite face: the pain of an entire nation, a pain that would not descend to mere complaining. The entirely nation not only honors him, it loves him deeply and fervently, for it has the feeling that he belongs to them. He is flesh of its flesh and spirit of its spirit. That shows itself in the smallest aspects of everyday life. It is plain in the camaraderie in the Reich Chancellery between the least SS man and the Führer. When he travels, he sleeps in the same hotel and under the same conditions as everyone else. Is it any wonder that the least of those around him are the most loyal?! They have the instinctive feeling that his is no facade, but rather the result of his inner and obvious spiritual nature. Several weeks ago, 50 young German girls from abroad, who had completed a year of schooling and were now about to return to their suffering home countries, visited the chancellor, hoping to see him for a moment. He invited them all to dinner. For hours they had to tell him of their modest lives. As they were leaving, they suddenly sang the song “If All Become Untrue,” and tears flowed from their eyes. In the midst of them stood the man who has become the incarnation of eternal Germany, giving them friendly and good-hearted consolation to encourage them on their difficult journey. He came from the people and remains a part of them. He who negotiated for two 15-hour days at a conference with diplomats of mighty England, who mastered arguments and facts on the great questions of Europe, can speak with complete ease to ordinary people, and can with a comradely “Du” restore the confidence of a fellow war veteran who greets him with a nervous heart after perhaps days of wondering how to greet him and what to say. The weakest approach him with confidence, for they sense that he is their friend and protector. The entire nation loves him, because it feels as safe in his arms as a child in the arms of its mother. This man is a fanatic in his cause. He has sacrificed his personal happiness and private life. He knows nothing other than the work that he does as the truest servant of the Reich.